On 26 December 2018, in accordance with an order from the Israeli High Court of Justice, Israel announced the allocation of so-called “State Land” on the southern outskirts of Bethlehem to the Ministry of Housing for the purposes of formal planning of the Givat Eitam colony. That decision to issue a planning licence will take effect later this month, 30 days after the announcement. This constitutes a key step in the process of forcible annexation of Palestinian land and is strictly prohibited by international law. BADIL condemns in the strongest terms this latest action by the Israeli government and calls on the international community to take immediate action to hold Israel accountable. This land has been the site of a 14-year struggle by Palestinians to prevent the establishment of this colony, sometimes referred to as the “E2 project”. This included 12 years of unsuccessful litigation through the Israeli judicial system following the August 2004 declaration of 1,341 dunams as state land. In addition to the state land declaration, 300 dunams in the area had already been acquired by Himanouta, a subsidiary of the Jewish National Fund (JNF), which is known to have engaged in fraudulent practices to acquire Palestinian West Bank land (see the map). The site sits directly on the outskirts of the built-up area of Bethlehem, on land that historically belonged to the Palestinian villages of Khirbet An Nahla, Artas and Khallet al Louza (see map). Being agricultural land outside the residential areas of these villages, it is land that was predominately classified as “miri land” under the old Ottoman Land Code, which meant the state held the raqaba, or ultimate ownership rights, but an individual could gain the right of use, or tassaruf, if they cultivated the land for a period of 10 years or more and paid a tithe. While initially, the tassaruf rights would revert back to the state if land was not cultivated for a period of three years or more, a subsequent change to the law in 1913, meant that ownership of miri land could transfer permanently to that private individual, without risk of annulment through non-cultivation. As such, much of this land had become privately owned Palestinian land, including 300 dunams privately owned by Mohammed ‘Ayesh of An-Nahla. It is a fact wilfully disregarded by Israeli interpretations of and amendments to pre-existing Ottoman, British and Jordanian land laws, applicable in the West Bank. Among other issues, Israel now considers “state land” to include miri land that has not been cultivated for at least three consecutive years, and miri land that had been cultivated for less than 10 years. These changes contradict the original legislation, are in flagrant disregard of international law, particularly article 43 of the Hague Regulations, and have had a substantial impact on land confiscation in the West Bank. Moreover, regardless of whether privately or collectively owned, occupied land is subject to international legal protections which prohibit its permanent seizure and destruction, and such acts constitute a grave breach of the Geneva Conventions, under article 147 of the Fourth Geneva Convention. 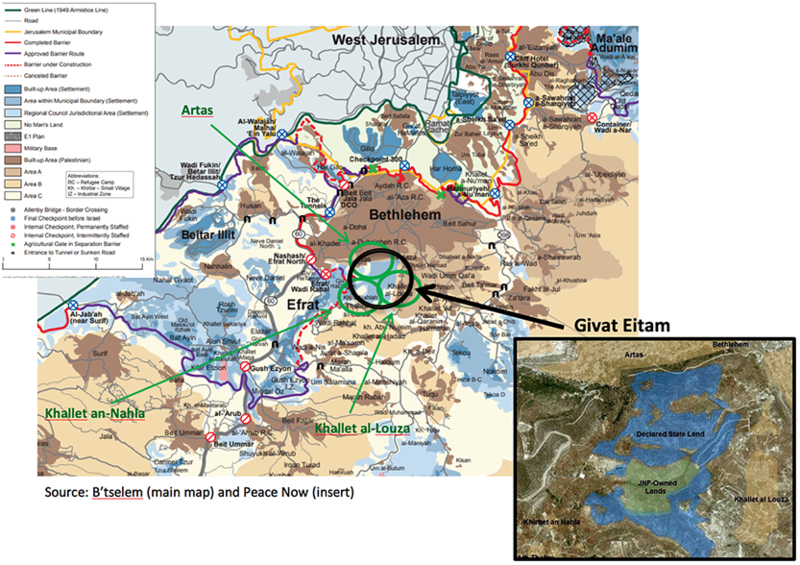 Nevertheless, after years of back and forth on plans to establish this particular colony, Givat Eitam has finally been given the formal green light from the Israeli Government. This follows several attempts between 2011 and 2018 by colonizers from Efrat to establish outposts there; various quasi-official approvals for establishment of an agricultural farm, including in 2011 from Minister for Defense Ehud Barak, and in August 2018 by the Higher Planning Committee of the Israeli Civil Administration; a halted attempt to approve tenders to the Ministry of Housing in 2013; and, in 2012, the allocation of 825,420NIS from the Ministry of Housing for architects to develop a plan for 840 housing units in the colony. Givat Eitam represents a devastating expansion of the colonial and annexation project that now encircles Bethlehem. It is a project that prevents Bethlehem’s growth to the north, with the Har Homa, Gilo and Har Gilo colonies of Jerusalem, and to the west, and south-east, with the ever-expanding Etzion colonial bloc, and will cut Bethlehem off from the rest of Palestine. More worryingly, it bears the hallmarks of long-standing Zionist plans to establish Metropolitan Jerusalem, which since 1967 have publically planned to engulf both Bethlehem and Ramallah, and ominously mirrors the Bantustans policy of Apartheid South Africa. Givat Eitam will become a “neighbourhood” of Efrat, and is slated for more than 7000 housing units, according to the Efrat Municipal Council website. Critically, this land is beyond the Separation and Annexation Wall, deep in occupied Palestinian territory, and forms a key part of the corridor that links the heart of the Etzion colonial bloc, to the west of the Wall, with its outlying colonies located to the south-east of Bethlehem – Tekoa and Nokdim. This corridor is home to more than 25 Palestinian villages of Bethlehem and large expanses of agricultural land on which Bethlehem depends; land which is now clearly subject to the looming threat of confiscation, as the colonial project continues its creeping expansion. In this way, Givat Eitam is a microcosm of the broader Israeli colonization and annexation project, one that is particularly evident in the Etzion colonial bloc. Under the guise of occupation, Israel deploys laws and military orders which give the vague veneer of compliance with international law, but which it manipulates to slowly acquire land, impose a coercive environment which forces Palestinian populations to relocate, and transfer Jewish colonizers into the land. It starts with an agricultural farm, and ends up a small city equipped with all the trappings of modern life. In the case of the Etzion particularly, of which Givat Eitam is part, its status in the mythology of Israeli nationhood – being the site of the largest loss of Zionist forces during the Nakba of 1947-49 and coming as that event did on the eve of the establishment of the State of Israel – is utilized by the Government to both justify its ever-expanding colonization of this land to the Israeli people and to spur calls for annexation of the land from the Israeli public. Meanwhile, Palestinians are being forced into ever shrinking spaces, without the necessary land on which to economically survive. This step in the establishment of the Givat Eitam colony demands urgent action from the international community. Without tangible action towards accountability, Israel will continue to be emboldened as it pursues its increasingly blatant policies of colonization, annexation and ultimately apartheid.